Sometimes it can be hard to find exciting exercises that kids like. Some kids feel that exercising lacks a percentage of fun, and thus, will not participate until their allowed to experience some enjoyment. However, it’s essential that children exercise up to thirty minutes every day. Daily exercise promotes the strength of healthy bones, strong heart muscles, and proper posture. In fact, most kids who go to a school of some kind have a class dedicated to physical education. Although kids get exercise in a physical education class at school, it’s critical that kids exercise at home too. Yoga has been getting popular in recent years for its exercise practices as well as its relaxing properties. In fact, yoga has gained so much popularity that mommy and me classes have begun to become a featured class in many yoga studios. Not only can kids learn from its work out strategies but also from its calming techniques. Through breathing methods, kids can learn how to channel their feelings, which can help in tense situations to fuse angry thoughts or actions. Therefore, yoga not only allows children to have an effective workout but also aids children in making wise future decisions. Many people know Zumba for its fast-paced dance music and choreograph exercise routines that mirror types of dance styles. Such fast-past music will excite any child and inspire them to get moving. In fact, Zumba even has a class which features only kids who want to have fun and exercise. In the class, there’s an instructor who will demonstrate the dance moves to the children and who will help them if they need it. Zumba for kids is a great way to get your child to exercise and still have fun in the process. Some parents don’t realize the amount of exercise that’s required to play on a playground. Each piece of equipment that’s located on a playground is there to test a child’s physical and mental capability. From monkey bars to alphabet signs, playing on a playground is a total body workout for children. However, since most kids are distracted by talking to their friends or playing a game with each other exercising their muscles and using their brain isn’t looked at as work. In fact, most kids say they enjoy playing on the playground due to the various pieces of equipment. While it’s true hiking might not be the most requested exercise among children; however, it’s known to be very beneficial for children and adults. Not only is hiking a total body workout but it can be great for mental health too. It’s proven that hiking can reduce stress and anxiety from a person’s life. Also, hiking is a perfect way to bond and connect with the beauty of nature, while hiking might be seen as extreme in some people’s minds, hiking if done right can be a fun-filled event. It’s commonly known that children naturally run in order to lower their energy levels. In fact, most children don’t think of running as an exercise but instead as a natural occurrence. Some parents may get tired of their children running around all the time; however, there are many health benefits to running. Some health benefits include stronger heart muscles, flexible muscles, and large calorie burn. Therefore, children who run are more likely to have stronger and healthier bodies. Some kids love to be challenged when it comes to their physical and mental strengths. Obstacle courses are perfect for testing a child’s capability at silly tasks. Most kids love obstacle courses for their unknown features and their timed segments which excites children about the prospects of winning. There are numerous ways you can make an obstacle course in your home. You can make one outside or inside depending on the amount of backyard space your house or apartment has. However, if you don’t have the time or don’t want to spend on the money on various equipment, you can always go to an obstacle park, although such parks are known to be expensive due to the number of obstacles. Most kids love the idea of rock climbing, but some parents caution against it due to the safety risks. It’s essential that your child’s instructor is licensed and has professional experience in rock climbing. While rock climbing might not be the safest exercise method, however, it is one of the most interesting. In fact, kids who rock climb have found that not only do they no longer have a fear of heights but their fears, in general, have decreased. Conquering a child’s fear can be challenging, but it can also demonstrate that it doesn’t have to paralyze them from seeking out future possibilities. Also, rock climbing will aid a child in accomplishing a total body workout. 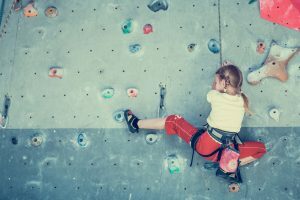 Therefore, rocking climbing may be influential in a child’s physical and mental health. A scavenger hunt not only has to be exciting for children but can also be enjoyable for parents too. Creating a list of silly items and hiding them in weird places around the house as well as outside can make a fun-filled game for everyone involved. In fact, allowing children to run around frantically searching for the designated items will enable them to get some exercise without them even knowing it. Therefore, playing a scavenger hunt game is a creative way to get your kids up and moving after a lazy weekend. If you don’t want to clean up a messy house after a game of scavenger hunt, there are fun community scavenger hunts that will allow your family to work together to find various items. However, some community scavenger hunts may be pricey due to a prize or award you might win at the end.